Our new, warm and modern guesthouse is perfect for travelers looking for a quiet refuge where they can relax, meet people and experience all interesting aspects of Thessaloniki, from its rich culture and colorful history to its relaxed days and vibrant never-ending nightlife.We have five spacious rooms with private kitchenette and bathroom, a common room where coffee and drinks can be served plus a beautiful garden area and a refreshing terrace, where you can sit, relax and meet with people. Guests can choose between a 2-bed private apartment, a 4-bed sharing dorm accommodation or a 6-bed sharing dorm accommodation.All rooms include beautiful views of the Old City, free Wi-Fi, free linen and towels, security lockers, air-condition, reading lights, ceiling fans, hot water, fully equipped kitchenettes and ensuite shower/toilet. There's also free coffee and tea, free city maps, travel information and city recommendations, reception, laundry facilities, our lovely garden café and no curfew!Located in the most picturesque, quiet and safe neighborhood - the centre of the Old City (Ano Poli) of Thessaloniki - just a short walking distance from the city centre and the most popular tourist sites. Harry and Vicky opened the doors of their hostel in the summer of 2011 and wish to offer you an unforgettable stay and another reason to make Thessaloniki your favorite destination!Please note:Cancellation Policy: 2 days before the arrival.Important:Our reception operates everyday from 08:00am to 00:00pm. Please advise us, if you plan to arrive outside these opening hours.Check In: From 12:00 pm to 00:00 am (if you come earlier or later let us know, so that we can make special arrangements for you). 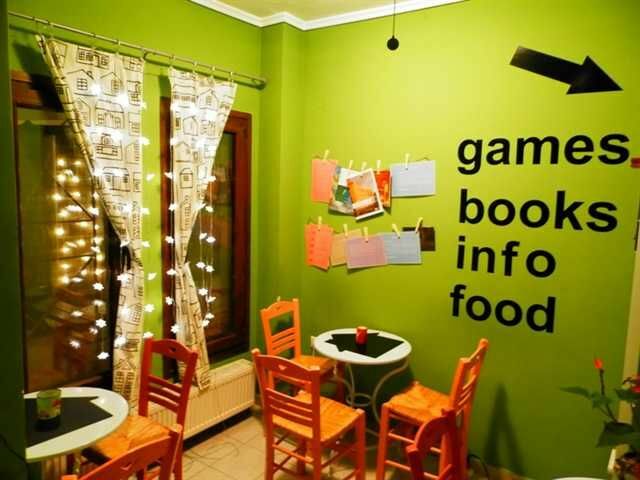 Check Out: 11.00 am Method of Payment upon the arrival: Credit card or CashBreakfast is not included. There is a daily breakfast buffet that one can join for 2 euro. There are two bus lines to get you to our door: Bus no. 23 & Bus no. 24 that you can take from city centre. Using either of the two, you should get off at bus stop 'Agios Pavlos' (ΣΤΑΣΗ 'ΑΓΙΟΣ ΠΑΥΛΟΣ'), which is a 4 minute walk from our hostel. By Bus no.23: After you get off, you continue downwards till you find a flight of downwards steps. Continue left and down till you reach Andokidou street (ΑΝΔΟΚΙΔΟΥ). 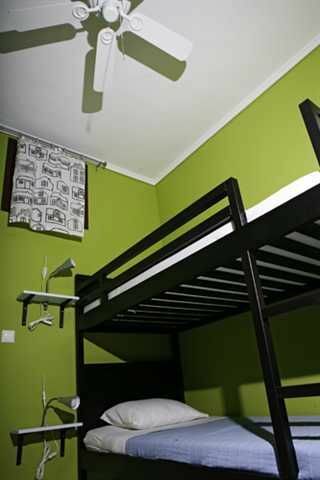 Our hostel is on your left hand at number 24.By Bus no.24: After you get off,cross the road towards a small church. Continue left and upwards passing by some taverns and cafes till you reach a U-turn, where you find a flight of downwards steps. Continue down till you reach Andokidou street (ΑΝΔΟΚΙΔΟΥ).Our hostel is on your left hand at number 24.By Taxi:Alternatively, the destination that you should give to a taxi driver should be either Andokidou Str. 24, or, Plateia Kalitheas (Kallithea Square) in Ano Poli (Old City District)'. In greek : ΑΝΔΟΚΙΔΟΥ 24, ΘΕΣΣΑΛΟΝΙΚΗ, ΑΝΩ ΠΟΛΗ, 54634. (Detailed directions in greek : 'Ανεβα?νοντας την οδ? Ακροπ?λεως, στρ?βουμε δεξι? στην οδ? Παπανικολ? και θα οδηγ?σει κατηφορικ? στην οδ? Ανδοκ?δου')From Thessaloniki International Airport (Macedonia-SKG): By Taxi: It's about 25 minutes from the airport and should cost between 20 to 25 euro, depending on the amount of luggage and the time of your arrival, as the fare is doubled after the midnight. By Bus: Bus lines no. 78 and no. 78N will take you from the airport to the city center in about 30-45 minutes depending on the traffic. It costs about 80 cents. Getting off at 'Plateia Aristotelous' (Aristotelous Square) bus stop and walk towards Venizelou square. From there you can take either Bus line no. 23 or Bus line no. 24. Being on either of these, get off at bus stop 'Agios Pavlos'. From there it is a 4 minute walk to the hostel following the directions above.From the Train Station (OSE) : You take bus 23 and follow the directions mentioned above. By taxi it will not cost you over 6-7 euro and it will take you 10-15 minutes to arrive.From the Central Bus Staion (KTEL) : You take bus 78 or bus 8 to the Train Station (Neos Sidirodromikos Stathmos) -7 minute ride- and from there you take bus 23 and follow the directions mentioned above.By taxi it will not cost you over 7-8 euro and it will take you 15-18 minutes to arrive.